The Waveney Inn dates back to at least 1879, when it was an overnight stop for the trading wherrymen who would moor up in the dyke in front of the pub. 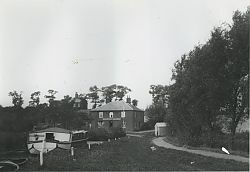 At that time it was known as Marsh House and has subsequently been known as Staithe House, Staithe Hotel and The Waveney Hotel. There was also an important ferry crossing here, which turned the long journey to Lowestoft herring market into a short 30 minute cycle ride. The ferry crossing fell into disuse in the 1950s but was restored in 2012, so now you can again reach the pub on foot from Oulton Broad and Carlton Marshes nature reserve. 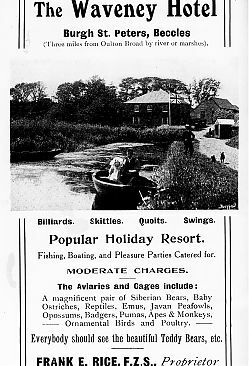 A century ago there was a small zoo just behind the Inn. Frank Rice, the landlord at the time, was famous for his Zoological Gardens complete with monkeys, a leopard and a ‘sacred white camel’. Sadly, two brown bears came to an untimely end when they escaped in 1907 and were shot by local villagers who then ate them – though not before posing for a photo. There’s no bear on our menu today. 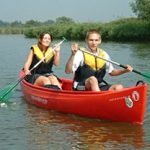 Over the years, the Waveney Inn has been knocked about, extended and remodelled numerous times and, in 2014, the Inn was comprehensively refurbished including the re-introduction of hotel rooms.